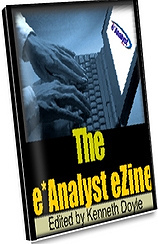 The e*Analyst Ezine... premier source of Internet Marketing Information on the net. "There's a lot of NONsense zapping around cyberspace about doing business on the web. Find out what works... what doesn't and what's worth your money !!" An Ezine can be the source of valuable information... or it can just clutter up your email inbox unnecessarily. Subscribe to an Ezine which delivers on its promise. If you're an Ezine article writer... or an Ezine publisher of a quality ezine on Internet marketing related topics we're interested in "trading some horses."